New York, July 21, 2010 – The ”Bordeaux Registry Book,” where the Portuguese diplomat Aristides de Sousa Mendes entered the names of all the people who received his visas to freedom during the Holocaust, was unveiled during a ceremony at the Museum of Jewish Heritage – A Living Memorial to the Holocaust to celebrate the 125th anniversary of his birth. 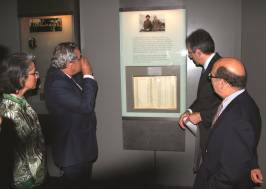 The loan of the ”Bordeaux Registry Book” was made possible thanks to the direct intervention of Mr. Luís Amado, Minister of Foreign Affairs of Portugal, who personally acceded to a request from John Crisostomo, vice president of the International Raoul Wallenberg Foundation, to lent the book. As Portuguese Consul in Bordeaux, France, and against the government’s orders, Sousa Mendes issued a great number of visas that allowed thousands of Jews and non-Jews to escape from the horrors of World War II and the cruelties of Nazism. More than 30,000 people survived the Holocaust thanks to Sousa Mendes’ courage. As a result of his disobedience, Sousa Mendes was expelled from the Portuguese Foreign Service. For decades, his name could not be uttered publicly in Portugal. He lived the rest of his life as an outcast, eventually losing his family home and dying in poverty on April 3rd, 1954. 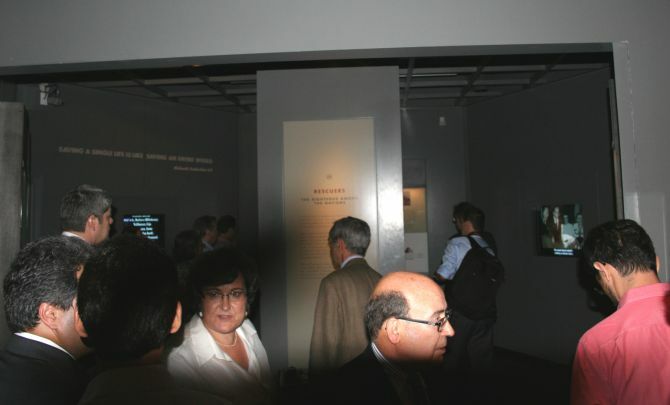 The exhibit of the ”Bordeaux Registry Book” marks the reintroduction of the Portuguese Diplomat into the ”Rescuers Gallery,” an area in the Museum dedicated to those brave men and women who saved persecuted people during the Holocaust that already includes other diplomats such as Raoul Wallenberg from Sweden.